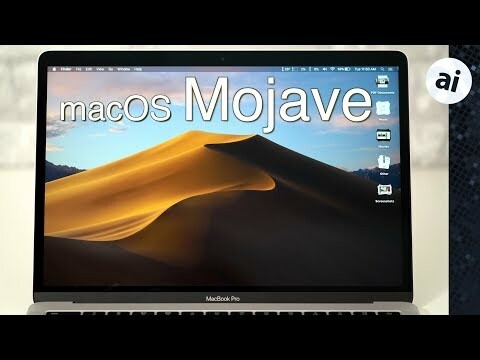 Apple has announced macOS 10.14 Mojave, the Mac maker's new operating system that will ship out to users this fall -- and here's everything you need to know about it. First and foremost, Apple's new APFS file system now supports hard drives and Fusion drives, so you'll be able to switch over to the new, more efficient solution even if your Mac isn't packing an SSD. After what seems like years of requests, Apple has finally introduced a new Dark Mode to macOS, which will be great for night-time use. The've even added a new dynamic Mojave desert desktop which will change based on the time of day, around the clock. Group FaceTime is coming to both macOS Mojave and iOS 12, allowing up to 32 people to join a FaceTime video chat at the same time. Many of you out there struggle to keep your desktop files organized. Apple added a new Stacks feature that instantly organizes your files, images, documents, and more, into groups accessible from your desktop. Whenever you add a certain file type to your desktop, for example, it will automatically be added into a stack. Simply click on a stack to see what's inside, scroll through to view individual files and double click to open one. Apple has added a new Gallery view to the Finder, showing all of your media, including images, screenshots, photos, PDFs and more. You'll see a big preview on top, with thumbnails on a row below. Images now get full metadata, showing everything from shutter speed to ISO settings. There's also contextual quick actions in Finder, allowing you to do quite a lot of things including custom automator tasks. The most important action, at least for me, is being able to quickly rotate images, within finder itself. You can instantly mark it up, and you can even add passwords to certain files and media. If you select multiple PDFs and images, you can create a PDF with all of those photos included. The coolest thing you can do is instantly add a watermark to selected images and PDFs. Apple also added a greatly updated Quick Look, which you can access by pressing the space bar while selecting a file. You can now invoke Markup, and even add a signature to a document, without having to leave the Quick Look menu. Even better, you can trim videos inside of Quick Look! You no longer have to bring your video into a video editor just to trim it. Screenshots also get an update. There's a new Screenshot HUD which includes some new options for capturing your screen, including screen recording, which previously required QuickTime or a third-party capture tool. You can either record the full screen, or for the first time ever, record a selected section of the screen, and from the looks of it, it puts a much smaller load on your processor. Whenever you take a screenshot or recording, a small snapshot will pop up in the corner of the screen. You can double click it and quickly mark it up, or even drag it right into a document or email. Apple has also added a new feature called Continuity camera. With it, you can select a media box within a slideshow presentation, and choose to take a photo on your iPhone. Your iPhone will instantly be prompted, and once you snap a photo, that image is instantly inserted into the app's media box. Additionally, you can also import scanned documents using your iPhone or iPads document scanner. Apple also announced an ongoing project that will allow developers to more easily port iOS apps over to macOS. They've already brought some key frameworks from iOS over to MacOS, allowing them to port over some existing first-party iOS apps, including News, Stocks, Home, and Voice Memos, with very few code changes. Let's get into some of those apps, starting with the News App, which saw a redesign with iOS 11. It's got Trending, top stories, and for you sections, along with a sidebar with news channels, which you can browse and search through. Stocks is finally coming to Mac, which is now redesigned, featuring the News app built right in. You can click on a stock to see a new interactive chart, and you'll see headline news stories relevant to each stock. You can even click on a story to see the full article without leaving the stocks app. Voice memos is also coming to Mac, and it syncs directly with your iOS device using iCloud. The best part is that you can drag your voice memo directly into apps like GarageBand. The Home app is coming to the Mac, giving you the same control over your smart home as enjoyed on iOS devices. With Home, you can run scenes from your Mac, monitor HomeKit video cameras, and use Siri for HomeKit commands. Moving on to some new security features, Safari is being updated to shut down social media link and comment sections while browsing to help stop advertising agencies from tracking your web usage. The Mac App Store is finally getting a redesign, with a brand new UI that boasts new Discover, Create, Work, Play, and develop tabs, making it easier to find exactly the app you need. If those don't help, you can still browse through categories using traditional methods or use the search bar. Video previews are also coming to the Mac for the first time, allowing developers to show you how the app works before you download it. They've also added a new Ratings and Reviews API for Mac Apps, making it much simpler to leave reviews. Apple highlighted a few longtime holdouts that are finally bringing their apps directly to the Mac store, including Microsoft's 365 Suite, Adobe's Lightroom CC and Barebones' BB Edit. Apple introduced a new technology for developers called Create ML, which allows coders to more easily train their models using Machine Learning. Apple says this should greatly increase the speed of model training, taking only 48 minutes instead of 24 hours for a specific training sequence on MacBook Pro. On the iMac Pro, that sequence will only take 18 minutes. Core ML 2 was also announced with 30 percent faster on device processing, a number achieved using batch prediction technology. As expected, Mojave is the last version of macOS to support 32-bit apps. To speed that along, the beta of Xcode 10 doesn't allow you to compile 32-bit apps at all. Also, Apple has announced that Mojave may be the last version of the operating system to support OpenGL and OpenCL. Some game developers are already threatening to abandon the platform if the complete removal ever comes to pass. For the lowest prices on Apple computers, check out our exclusive deals on Mojave-ready Macs. Great. What’s the system requirements? Did it still support Macs with Core 2 Duo processors? Edit: just saw the list, nevermind. Wow. Would be so great if I had a functioning MBP Keyboard to run this MacOS. ”Apple highlighted a few longtime holdouts that are finally bringing their apps directly to the Mac store, including Microsoft's 365 Suite, Adobe's Lightroom CC and Barebones' BB Edit.”. BUT because these will only be subscriptions- no stand alone versions. MacOS has never been about gaming, but with AR focus it could be. All of the recent kit Apple is providing (eGPU, APFS, 64 bit, metal GL) are required for AR, but will allow Macs to finally have the capability to be some of the strongest gaming machines in the industry. The problem for game developers has always been the chicken or the egg with Macs (iPhones long ago established itself as a game leader using iOS), there were not enough Mac gamers to justify coding (but Apple tried to make it easier with porting). Apple’s strategy now is to have really strong graphics capabilities for Macs (and Mac Pro) with MacOS as the platform for AR (and game) development. All of which allows for Mac & iOS cross porting. I know the possible deprecation of OpebGL/CL is of concern to game developers, but they need to see this as a cup half full, as they will have the opportunity to program AR (and eventually VR, which is what games really are about) on leading tech kit with Apple. If Open GL/CL is to remain relevant in a Meral/DirectX world, it will need to become more robust by providing standards for newer hardware. I'm concerned that Mojave eliminates Spaces (i.e., multiple logical desktops), which I use heavily, as Mission Control seemed to be missing from the dock in the demonstration. It's not clear to me that Desktop Stacks have equivalent capability but perhaps they do? Can anybody confirm either way yet? I can't imagine them being eliminated from Mojave. Ok I give in. I can access the screen capture video record functions on my MBP's Touch Bar but I cannot find how to do the same on a nMac Pro without Touch Bar. How do you invoke the record Hud, after selecting the screen capture area and double clicking the small view in the lower right corner that appears, on a non Touch Bar keyboard. Fear not we still have Mission Control in Apps folder and can have multiple desktops and can swipe between them. Yeah, was gonna say Craig was swiping between Spaces. Maybe they just don’t include M.C. in the Dock by default, not sure why anyone would use the Dock to launch it — I use a hot corner to launch MC and he various trackpad gestures for the subset of actions. thanks to all, I was hoping this was the case. Im actually very excited about this update, and I haven’t been excited about a mac os update for many years. Will make my new Macbook Pro even better. This might sound small, but you know what I’d like to see? The ability to copy/paste a few different text fields (e.g., “Copy 1/Paste 1”, “Copy 2/Paste 2”). I'm looking forward to the new anti-fingerprinting tech for Safari on desktop as well as mobile. If they implement it well, it will be a huge boon for privacy, as up until now avoiding fingerprinting has been very difficult. Anything that makes it more difficult for the Goog/FB/data brokers to track people will make me very happy. The new Like/Share button blockers are cool, but if you use a good Content Blocker this is already taken care of. Content Blockers are one of my favourite things about Apple products. It is a shame so few people really use them. Any relaxing of the requirements for apps in the Mac App Store? Without any changes there, most developers will continue to shun it. Obviously, if Transmit and BBEdit are coming, they've relaxed some major restrictions on the sandboxing that prevented those apps from functioning. This bodes well given there has a been a lot of FUD about the App Store getting increasingly locked down. Re my above question ... I solved the video screen capture on a non Touch bar keyboard myself. Easy when you know how! No audio for those that were asking in other posts. I assume that's to prevent copyright violation. Bets on how many are going to pronounce it "Moe- jayve." Very simply - and you can do it now, if you want. copy'em paste or others... up to you. Will be nice to finally move my Mac Mini with Fusion Drive up to the current OS. Wonder what the hold up was?